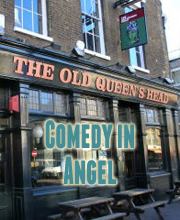 After yet another sell-out comedy night, Laugh Out London returns to the Camden Head in Camden for another bargain evening of great alternative comedy, including the legendary Stewart Lee performing in one of the most intimate venues he’s played in years. Price is £3 advance or £5 on the door. Please note, advance tickets are SOLD OUT. There may be limited availability on the door. After another complete sell-out run at the Edinburgh Fringe, Stewart Lee returns to Laugh Out London to play one of the most intimate shows he’s played in years. He’s the star of Stewart Lee’s Comedy Vehicle on BBC and producer of the Alternative Comedy Experience on Comedy Central. And of course, he’s Stewart Lee! One of Laugh Out London’s favourite acts, surreal character act Holly was chosen as The Independent’s One To Watch in comedy for 2013. An act that’s harder than most to define, Holly was also chosen as Harry Hill’s best comedy newcomer in the Radio Times. He’s the slightly insane genius who directed a sell-out run of the live version of Steven Speilberg’s Hook featuring an all-star cast of London’s best upcoming alternative comedians. Poems and jokes from this young comic. A unique mania that unites an audience like no other act.